What is great about Euler’s formula is that it can be understood by almost anyone, as it is so simple to write down. Euler’s formula can be understood by someone in Year 7, but is also interesting enough to be studied in universities as part of the mathematical area called topology. Euler’s formula deals with shapes called Polyhedra. A Polyhedron is a closed solid shape which has flat faces and straight edges. 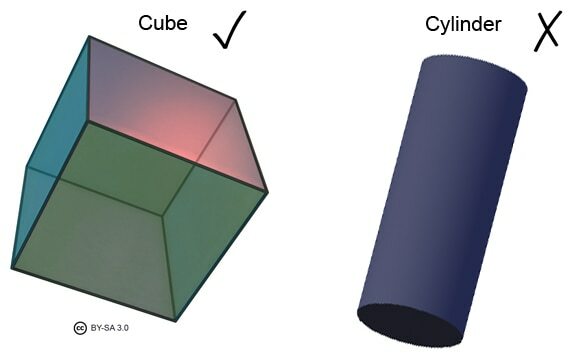 An example of a polyhedron would be a cube, whereas a cylinder is not a polyhedron as it has curved edges. 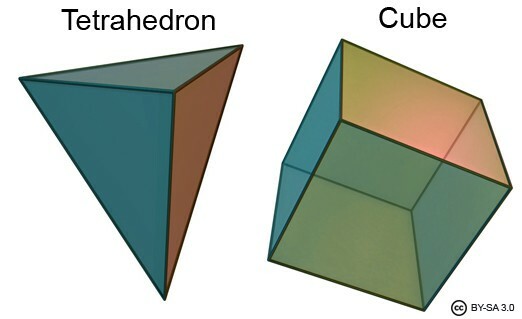 Let us check that this works for the Tetrahedron (triangle based pyramid) and the cube. Euler’s Formula does however only work for Polyhedra that follow certain rules. The rule is that the shape must not have any holes, and that it must not intersect itself. (Imagine taking two opposite faces on a shape and gluing them together at a particular point. This is not allowed.) It also cannot be made up of two pieces stuck together, such as two cubes stuck together by one vertex. If none of these rules are broken, then F+V-E=2 for all Polyhedra. Euler’s formula works for most of the common polyhedra which we have heard of. There are in fact shapes which produce a different answer to the sum F+V-E. The answer to the sum F+V-E is called the Euler Characteristic χ, and is often written F+V-E=χ . Some shapes can even have an Euler Characteristic which is negative! This is where it can all start to get quite complicated. If you want to find about the Euler Characteristic of some of the strange shapes below, why not take a look here. 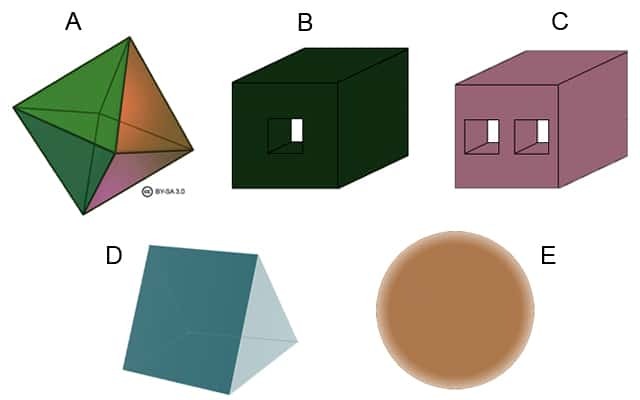 The Euler Characteristic helps us classify shapes and is studied as part of most undergraduate mathematics degrees as part of a topology course. Can you now work out which of the following shapes should have an Euler Characteristic of 2? Answer: A and D have an Euler Characteristic of 2 as they are polyhedra which follow all the required rules. 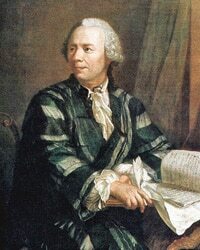 Leonhard Euler (1707-1783) was a Swiss mathematician who is thought to be one of the greatest and most productive mathematicians of all time. Euler spent much of his career blind, but losing his sight only seemed to make him even more productive and at one point he was writing one paper per week, with scribes writing his work down for him. There is more than one formula named after Euler, and the one we have just looked at is sometimes called Euler’s Polyhedral formula. Euler’s other formula is in the field of complex numbers. Euler is pronounced ‘Oiler’. If you would like to find out more about Euler’s Polyhedral formula, including a proof, then take a look at this article in Plus magazine. 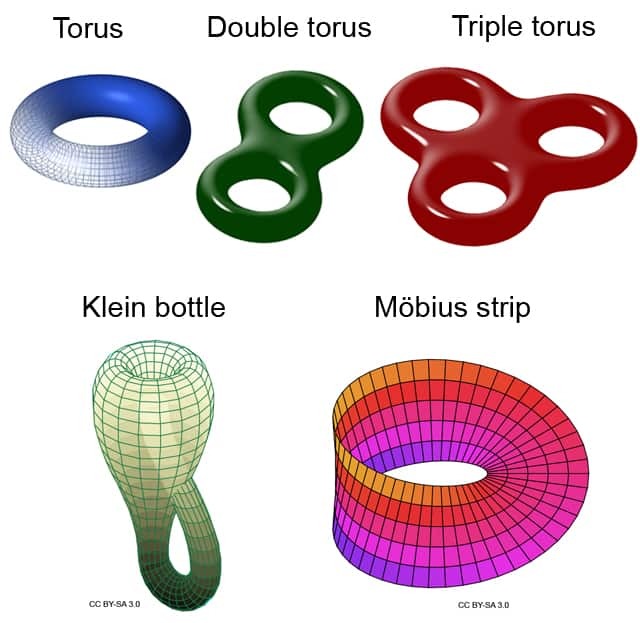 It’s not a joke, but a strange mathematical object called a Möbius strip. Why not make one at home?